This kit is suitable to aerate a 1/2 acre to 2 acre lake up to 50 feet deep. It includes a (MPC120C)Matala 1/2 HP Rocking Piston Compressor with 3 way manifold , 300 feet of 3/8" Sinking Air Hose, three Air Bases with total of six 9 inch Air Disc Diffusers. The disc base will help keep the air diffusers up out of the mud. Visit www.MatalaAerationProducts.com for more information. 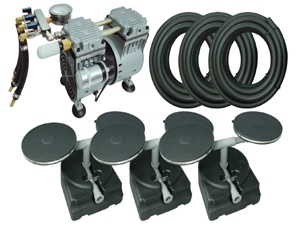 This kit will help destratify and aerate the pond from top to bottom. Reduce algae growth and bottom sediment. Improve clarity and fish health. The Diffusers should be placed in the very middle or deepest part of the lake to function correctly. If your lake is bigger than 1/2 acre upsize to the next level. Our aeration kits combine all your fittings, hoses, air diffusers and Hakko pump to match your requirements. This makes it easy for you to get the right set up for the best results and long term performance. Click PDF tab below for more data.